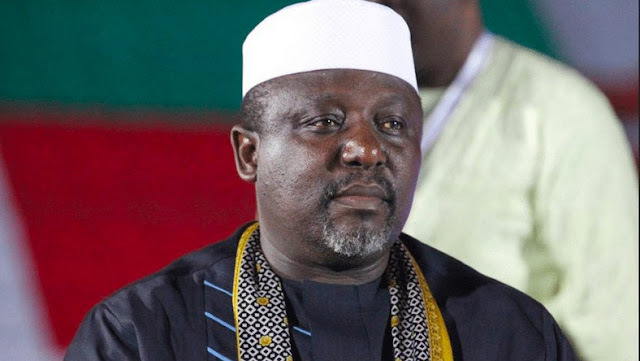 The Independent National Electoral Commission on Monday morning declared Governor Rochas Okorocha of Imo State, the winner of the Imo West senatorial election. The Returning officer, Prof Francis Ibeawuchi, who announced the results at the collation center in Orlu Local Government Area, said that Okorocha of the All Progressives Congress polled a total of 97762 votes to defeat his two major contenders. According to the Returning officer, Jones Onyereri of the People’s Democratic Party scored 63117 votes to come second while senator Osita Izunaso of the All Progressives Grand Alliance garnered 30923 to come a distant third. The declaration of the result sparked protest and jubilations at the premises of the INEC office. While the supporters of Okorocha celebrated, the supporters of the PDP candidate rejected the outcome.